I filmed a few time-lapse videos while I was drawing a recent commission. 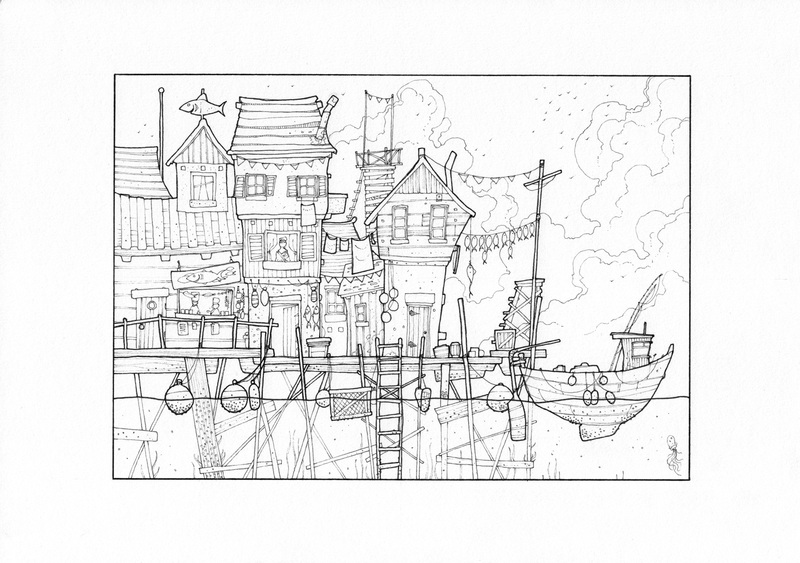 It’s of a stilted city, similar to a couple I’ve drawn before. I’d already sketched it out in pencil before I started filming, but I’ll try and do the whole process from start to finish at some point. The first shows me putting in some initial lines with a fine pen. This is how I usually start inking any of my drawings. It’s basically outlining all the main elements at this point. Illustration timelapse 1/4 from thisnorthernboy on Vimeo. The second shows how I add a nice thick line to foreground elements, to areas I want to highlight, and in this case a key line around the whole illustration. Illustration timelapse 2/4 from thisnorthernboy on Vimeo. In video three I add detail, texture and any odd little bits of grit and noodling I feel it needs. All with a very fine 0.03 pen. Illustration timelapse 3/4 from thisnorthernboy on Vimeo. Lastly I add in some clouds and birds in the distance. I love drawing clouds. I actually added a couple more bits of detail after this – drawing in some barnacles and seaweed on the submerged bits of the drawing. Illustration timelapse 4/4 from thisnorthernboy on Vimeo. This was drawn on Daler Rowney, Fine Grain, 200gsm cartridge paper. I used Copic Multiliners in thicknesses of 0.03, 0.05, 0.25, and 0.5. That’s a fantastic series of videos! Thank you for sharing the process of your artwork with us.